Jeremiah Duggan, 22, died from fatal head injuries in the city of Wiesbaden, Germany, on March 27, 2003 after he had ran onto a motorway in front of traffic and was hit by two cars. The British student’s death baffled German police and was labelled a suicide. While studying at the Sorbonne in Paris, Duggan had become involved with Nouvelle Solidarité — a newspaper published by Lyndon La Rouche, an American right-wing conspiracy theorist. Duggan had traveled to Germany for a conference at the Schiller Institute, part of LaRouche’s group. It is not known what led the student to call his mother, as well as his girlfriend, and then to run into traffic. But Andrew Walker, a coroner in England, has now ruled that the young man did not commit suicide. the coroner also rejected the assertions of several expert witnesses instructed by the Duggan family, that the scene of their son’s death had been arranged to appear as suicide. The coroner’s report says injuries discovered by a pathologist suggest that Mr Duggan may have been involved in an altercation at some stage before his death. “I’m not sure I will do it through the justice system because I would like to think very hard about whether or not the kind of investigations that have gone on in Germany and also in Britain have led me to find out how my son really died. 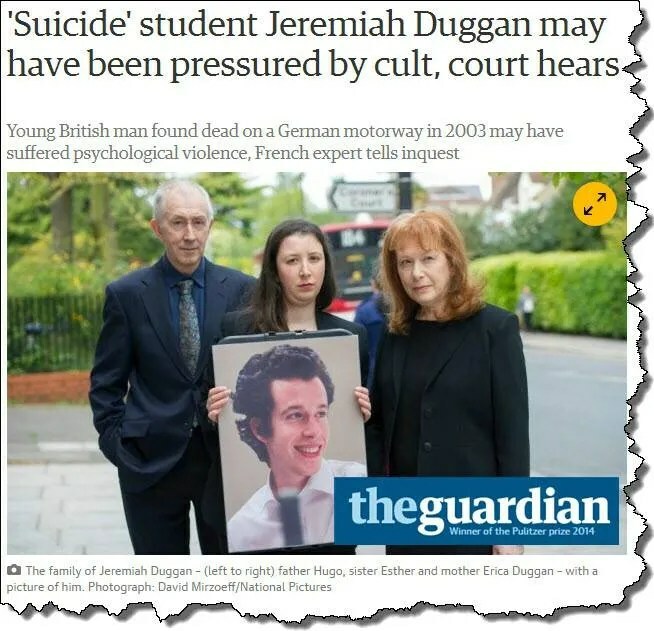 Jeremiah’s family want German authorities to open a new, deeper investigation, including examining the role played by the LaRouche organisation. Information about Lyndon LaRouche’s Political Action Committee — on the website of cult expert Steve Hassan.